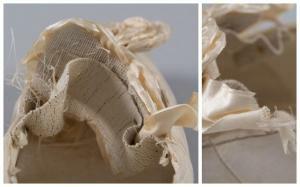 by Jamie Robinson, 2nd year student, MPhil Textile Conservation. In the first semester of the second year students at the Centre for Textile Conservation undertake an intensive two week adhesive workshop. Adhesive treatments tend to be used by textile conservators for objects which are either brittle, painted or non-textile or where access for stitching is limited or restricted and their successful application requires a good understanding of both science theory and conservation practice. A variety of adhesives and concentrations are sampled; films are cast onto a selection of support fabrics, then reactivated using heat and/or solvents. Following this, samples are scrutinised, while the merits of each as a potential support for severely degraded textiles are discussed. Finally, when we have proved that we know our polyvinyl acetates from our cellulose ethers and our Lascaux 303HV from our 498HV, we are allocated our own historic object which necessitates such a treatment. 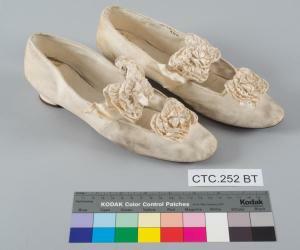 19th Century Wedding Slippers Before Conservation © CSG CIC Glasgow Museums Collection. My object is a pair of mid-19th century wedding slippers in soft ivory leather adorned with satin ribbons and rosettes, from the collection of Glasgow Museums. The shoes are to be displayed with a wedding dress belonging to the mother of John Logie Baird; the Scottish engineer and inventor of the television. This will form part of an impressive collection of 19th century costume to go on exhibition in 2015. It is not difficult to become completely immersed in a textile object while studying it and certainly one of the joys of undertaking such a project at university is that time is allocated specifically for this purpose. These slippers exhibit the distinctive short ‘knock-on heel’ fashionable of the period, cut from wood, wrapped in leather and seamed to the centre breast (the forward facing side of the heel). The ‘knock-on’ name refers to the nailed construction, all the more prominent in the case of these shoes, where holes to the left insole expose the rusted construction pins below. It is snippets of information such as this that help us to build up a broad understanding of an object; not just where and when it came from but also what has happened to it during its lifetime, this will in turn impact on treatment decisions. My treatment proposal involves stabilisation of the severely fraying, fragmentary ribbons with a silk underlay, applied with an adhesive film. And so, after much object contemplation, the adhesive trials start again (this time in context), for my proposed adhesive must be tacky enough to allow realignment and reconstruction of fraying fibres and strong enough to secure them in place once activated. My decision to use a combination of adhesive and stitch support methods should allow me to use the adhesive more sparingly, in a fairly low concentration, thereby retaining textile flexibility. Films are trialed in combination with stitching on lengths of ‘test’ ribbon acquired for the purpose and tomorrow the painstaking task begins under the supervision of Karen Thompson, Conservation Teacher. 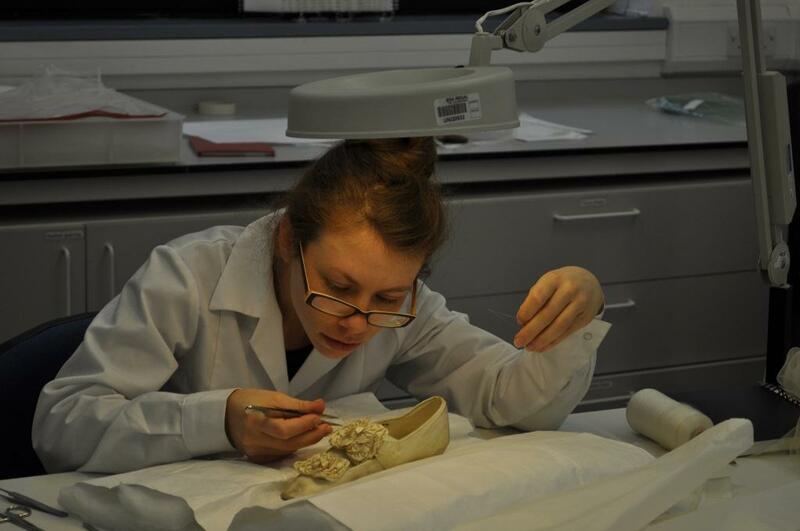 While I am understandably a little anxious, this is a fantastic opportunity and I am so grateful to Glasgow Museums for entrusting me with the preservation of these significant slippers. 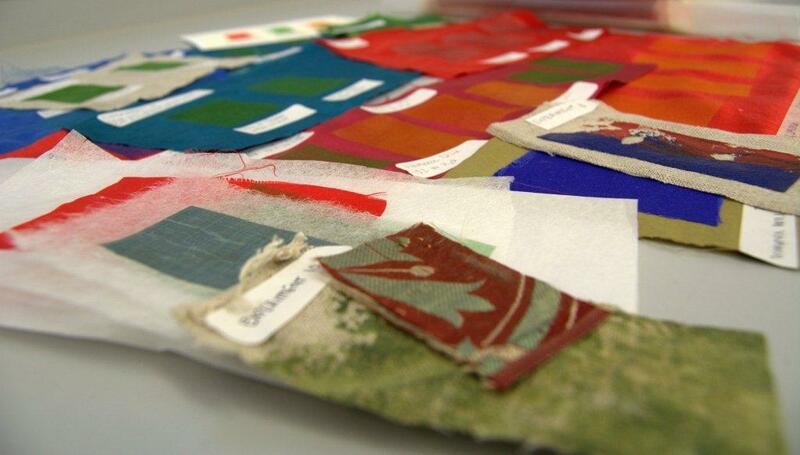 Stitching in Progress © CSG CIC Glasgow Museums Collection and University of Glasgow.